Greely Sand & Gravel owns a licensed snow dump, allowing us to plow, remove, and dispose of snow from commercial properties. Our domes are well stocked with rock salt, Thawrox (treated salt), salt chip mix, and salt sand mix. Greely Sand & Gravel has an extensive fleet of loaders, front-mounted snowblowers, snowplows, and spreaders, as well as a fleet of trucks and trailers. Snowblower removing snow from Rideau Carleton Raceway track. Greely Sand & Gravel maintains 24/7 surveillance by visiting sites to monitor snow and ice conditions, allowing us to respond quickly in case of a weather emergency. We have GPS tracking on all our equipment to create accurate logs of the dates and times our equipment was on site. We use the KSMI Weather reporting service which provides us with up to the minute information on weather conditions. In 2017, Greely Sand & Gravel obtained Secret level security clearance and is now eligible to undertake snow and ice management contracts at government buildings and other secured facilities. At Greely Sand & Gravel, we pride ourselves on offering professional services to the properties we manage throughout the demanding winter months. We recognize the danger that snow and ice pose to motorists and pedestrians and we do our best to alleviate all risks by employing state-of-the-art snow and ice management services for commercial properties. 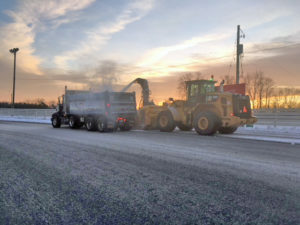 Greely Sand & Gravel seeks to protect the environment by employing Smart Salt practices to diminish the amount of salt needed to remove snow and ice. Our Thawrox salt is treated with environmentally friendly materials that act quickly to melt snow and ice, reducing the amount of salt needed to clear roads, parking lots, and sidewalks. If you are looking for a reputable and reliable snow and ice manager for your commercial property, contact Greely Sand & Gravel today! Do you require our Commercial Credit Application? If you check 'Yes', the application form will automatically be emailed to you after you submit this form.